I couldn't wait to try this recipe. Cantonese-style roast meats are delicious. Even the recipe name sounds good. 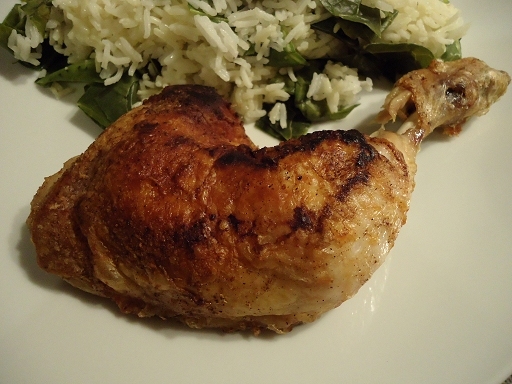 Here are the changes I made: I didn't use the Chinese rice wine in the marinade, and I shallow-fried then oven-baked the chicken rather than deep-frying it (you know me by now). Also, I couldn't find the malt sugar that the recipe calls for; it's used with rice vinegar and boiling water to scald the skin after marinating and before seasoning and cooking. I had intended to make do with white malt vinegar and caster sugar instead, but, alas, I forgot the caster sugar, so spent the rest of the cooking process wondering if I'd inadvertently left out an important source of deliciousness. Once the chicken is marinated, scalded and seasoned, the recipe says to "Hang up and sun dry for 1 hour." But no. a) I have no desire for my chicken to sit at room temperature for longer than it has to, especially after the scalding got it nice and warm. b) The weak sun in autumn in London at 7pm isn't going to dry anything. And so I put the chicken in the fridge and let it drip-dry in a colander. All these things might have made the chicken slightly less tasty, but a recipe like this can't be too horrible. OR SO I THOUGHT. It turns out that this is, hands down, one of the most disgusting things I've ever eaten. I made two chicken legs (enough for two nights in a row) but couldn't eat much of the second one because I honestly thought it was going to make me ill. Let me set this straight: the problem here is not Cantonese-style chicken. Nor is the problem whatever faff I had with the marinating and the scalding and the drying. The problem is that there must (surely) be a typo in the recipe because IT WAS SO SALTY. Perhaps I should have been alerted to this when the recipe asked me to use a whole tablespoon of salt to season just two chicken legs, but I wasn't and blithely continued on. What this recipe would taste like in normal circumstances I have no idea. All I could taste was salt. It felt like my internal organs were drying up. NO NO NO. This Jamie Oliver recipe sounded worryingly healthy (read: bland) at first glance, but it wasn't at all. It has a lot of flavour from the ginger, garlic, onions and lime. I've never had lime in a stir-fry before, but it works. 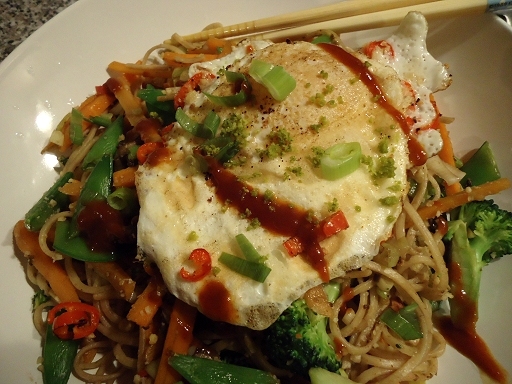 The lime comes together with the chilli sauce and egg yolk to make the noodles moist, piquant and rich, and the toasted cashews add to the richness too. I'm not normally a fan of nuts in my food, but the cashews added a lovely toasted, almost popcorn flavour. I will say though that there is a lot of chilli in this dish, particularly in the fried egg, and I would have preferred it if the whole thing was less hot. Chilli aside, I would count this as a successful recipe. It is, however, exactly what I expected from one of Jamie's "easy 30 minute meals". Anything that involves zesting a lime and/or toasting cashews then putting them in a bloody pestle and mortar is not easy, my friend. It took me an hour and half to make it, and almost the same again to clean up afterwards. More nuts in my food, which I'm not keen on, plus fruit in a savoury dish, which I like even less (I'd never had fresh papaya before, so I had to frantically google how to prepare it). All this plush fish sauce? And more chilli? Oh God. And I had to get out the damn pestle and mortar out again! All these things proved exactly why I like to try recipes that sound horrible on paper, because this dish was DELICIOUS. Absolutely lovely! I mean, sometimes you add ingredients you hate to a dish, and you end up hating the dish as expected, but sometimes they magically come together to make something really great. 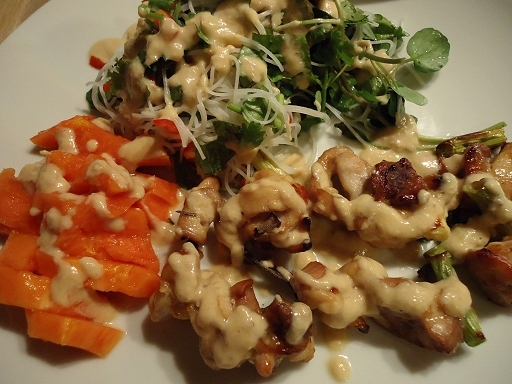 The marinaded chicken is yummy and that peanut sauce just takes things to the next level. Even the chilli in the noodles and the papaya on the side worked. Well, the papaya was a bit weird (perfumed and fruity), but it still tasted good with the sauce. In hindsight, I was so taken up with the ingredients I didn't like, that I completely forgot to notice how many ingredients I love are in the dish. Lime and coriander is a marriage made in heaven, and mixing them with soy sauce (yes!) and sesame oil (yes!) and basil (why not?) made for a super tasty meal. My only problem is that the recipe seems to think that 120g noodles will feed four people. How that's supposed to fill anyone up, I don't know; I hit the snacks afterwards. This was less of a recipe and more instructions on how to prepare an orange so you can drink the juice straight from the top of the fruit (the book says this is a common way of buying orange juice on the street in West Africa). Basically: peel off skin, cut off top, use a knife through the hole in the top to poke the flesh a bit, then apply to face whilst squeezing. It was fun! And you honestly can't get orange juice any fresher. 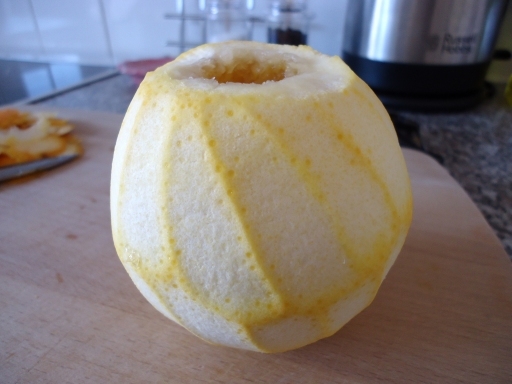 I probably didn't prepare my orange super well, because I couldn't squeeze loads of juice from it, but that doesn't matter, because I then pulled the orange apart and ate it. This is one of those recipes that proves vegetarian food isn't boring. The whole risotto is like an umami punch in the face. 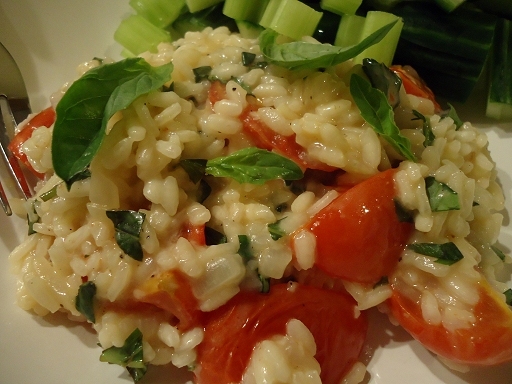 I love risotto, and this one is really tasty with the cheese and the tomatoes and the onions and the basil. Honestly, for such simple ingredients (I even left out the wine), it works well. Plus, it's not hard to make by risotto standards. The only issue I have is, again, with the portion size; the amount of risotto this recipe makes is disappointingly small. Otherwise, this one's a winner! I HOPE YOU FEEL BETTER SOON/IMMEDIATELY! The Cantonese chicken leg is the weirdest recipe I have ever heard of; “scalding” a piece of already-marinated chicken? And then letting it sit? Whaaaaat. Presumably the sugar would’ve balanced the salt and made it less astringent, but maybe not. I don’t know about that recipe, man. Be careful! I also don’t like nuts in any dish but “a dish of nuts.” Also I hate peanut sauce. However, I would fight somebody for a bowl of that risotto; it looks fabulous! I am also impressed with your doctrinal fortitude in the face of a cold. If I even have the sniffles I’m down for the count with an ambulance on speed-dial. Thanks for the well-wishes! I wrote the post when I was at my most melodramatic (I kept sighing heavily to myself whenever I had to walk a few steps) but I was feeling miles better by the next day. Now I just have a slight cough and nothing else.